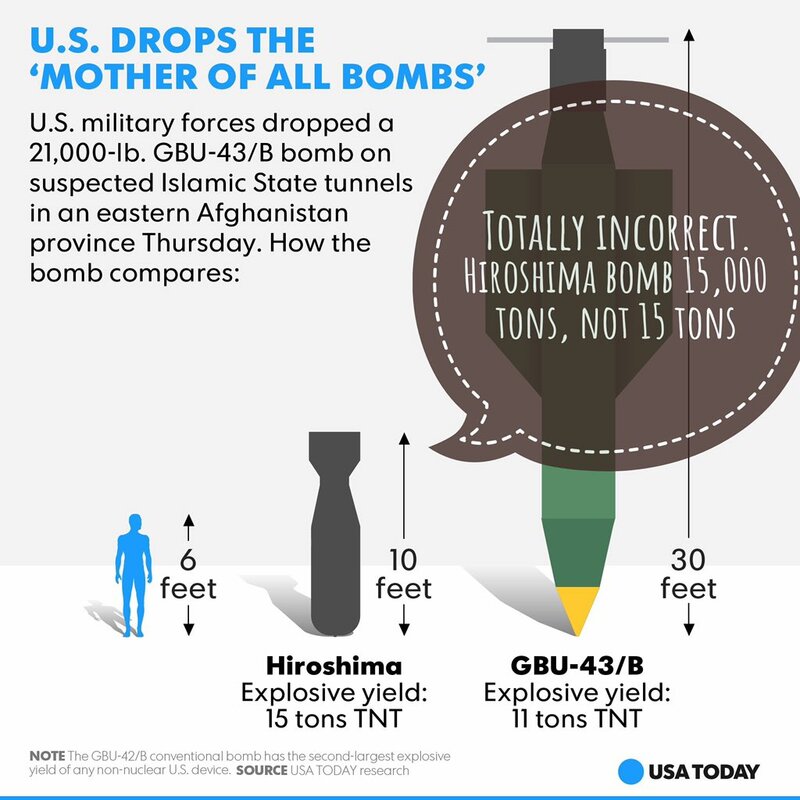 22,000 pound Mother of all bombs dropped on ISIS. Is Trump sending North Korea a message? I haven't heard much about Iran in the news. Wonder how long that will last. edit: I had forgotten about the Massive Ordnance Penetrator (MOP). That one is a 30,000 pound beast. Last edited by Ranger; 04-13-17 at 09:45 PM. Even Hitler didn't resort to dropping 22,000 pound bombs. Here's a picture of me at Moab. I had 10x a better time than the people at Hiroshima. Was this MOAB a bigger bomb than Ghost in the Shell? Gracchus: I think he knows what Rome is. Rome is the mob. Conjure magic for them and they'll be distracted. Take away their freedom and still they'll roar. The beating heart of Rome is not the marble of the senate, it's the sand of the coliseum. He'll bring them death - and they will love him for it. So the attack killed 36 of an estimated 5000 ISIS fighters. Plus the people who feel threatened enough to now join up. ISIS runs on ideology. It's like trying to reason with deeply religious people. I just don't see any level of "shock and awe" putting a dent in their operation. Win the war by having better ideas. And going after their money (this is already part of their strategy). AP is reporting the deaths as over 94. If you feel threatened...you're not just going to "join ISIS". This isn't a Mary Kay club for disgruntled wives. Going after their money has had little effect. Because they deal with countries who don't abide by monetary stipulations. Like Iran. And even Russia to some extent, and China, etc. They smuggle weapons, launder money in ways where the US cannot completely contain. It's like trying to say War On Drugs will be successful on cocaine trafficking because we shut down their bank accounts. There will always be risks in killing civilians...and a small minority of those civilians takes up arms against the very cause that was trying to rescue them on the whole. However, to say let's not do anything against terrorists because we might "fuel the fire" is not a good policy. Because the fire will come to you eventually. Apparently both the Bush and Obama administrations chose not to use this bomb because of its potential to kill a lot of civilians. For the American public, it underscored the Pentagon’s more aggressive stance under President Trump than under his predecessor, whose administration never even debated using the weapon. In Afghanistan, with its rural and agrarian economy, civilians who are engaged in food-gathering, woodcutting, farming or tending herds are often near or beside concentrations of militants. The blast radius of an explosion of this size could pose risks to people far from the center of the target. But commanders discarded the option when analysts estimated that the bomb’s blast would also kill thousands of civilians. “The collateral damage would have been massive,” said Marc Garlasco, who led a team in the military’s Joint Staff that was seeking to target Mr. Hussein. The blast radius is theoretical, based on equal dispersion on flat ground. If you're planting a bomb in a mountain area...the blast "radius" is extremely reduced due to obstacles such as large rocks containing the blast. Not saying no civilians are killed...but the "blast radius" is very situational. P.S. Bush was a dumbass (I think we know historically, this is pretty much the case although I do respect some policies he was responsible for). The MOAB is perfect for areas where you don't want to put Americans...lots of Americans...in jeopardy. And to crank that ideology up a notch...that's why we have nukes. Not just for displaying what we could do...but it would save hundreds of thousands of lives if absolutely no other option was available. Last edited by DVD Polizei; 04-15-17 at 11:24 AM. According to Gunnery Sergeant Jessie Jane Duff, U.S. Marine Corps the purpose of the bomb was to "kill the bastards"
Marines are like that, just ask Mad Dog Mattis - "Be polite, be professional, but have a plan to kill everybody you meet." Afghan officials are reporting that nearly 100 ISIS fighters including four commanders were killed in this MOAB strike. Well, in general, things that can be fixed by bombing can be fixed by killing the bastards, or breaking things. Bombs don't build infrastructure. Not clear what your are saying but soldiers are trained to kill people and break things. It's up to 90 per the BBC, though my understanding is it will be virtually impossible to get an accurate count due to the fact that any caught in the blast radius, excluding those at the outer edge, were either essentially vaporized or buried within the collapsing tunnel network. I'm fully onboard the Trump hate train, but if the reports are true this feels like an appropriate use of the MOAB, given the circumstances. Last edited by ultimaton; 04-16-17 at 01:39 AM. Interesting that the US military doesn't seem to be holding back after it appears that they may have killed 200 civilians with airstrikes in Mosul, Iraq. Also interesting that the US military may be moving from comabt drones to heavy bombers. The FOAB is smaller than the MOAB but has twice its blast radius and weighs 15,000 pounds. Last edited by Ranger; 04-15-17 at 11:05 PM.